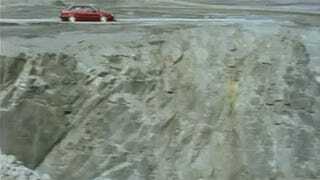 Have you ever wondered what would happen if you drove your car off a cliff? Volvo did. There's a crash test of a brick-on-wheels 850 careening into a quarry. I get the feeling Volvo does this stuff just because they're bored. In any case, I now have an idea what my crumpled cliff-related death would look like. Good to know.